Based at Largs Marina, Maritime Craft Services (Clyde) Ltd operate a fleet of workboats and support vessels mostly in northern European waters. 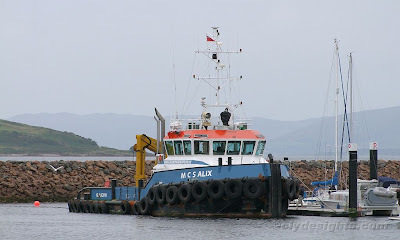 MCS ALIX is a Damen Shoalbuster 2609 vessel, and was delivered to the company by the prolific Dutch shipbuilder in December 2005. With an overall length of 26.08 metres, and a gross tonnage of 161 tons, MCS ALIX has a bollard pull of 29 tonnes thanks to her twin Caterpillar main engines. She had arrived at Largs from Belfast on Thursday 13. Popped up on AIS a few times as well John. Nice to put a face to a name! !